Like a Sunburn: Two Mondays ago I had this conversation with my general practitioner. “Kind of like a sunburn?” my doctor asked. “Exactly, except that when I touch it or apply pressure it feels better. In fact, I feel best when I’m wearing bike shorts or swimming or running . . . or when my clothes can’t even brush against my skin.” By mid-week I was walking around holding my hip, which made the discomfort bearable. I could also be heard exhaling deeply from time to time to take my mind off the pain. My doctor was starting to look like he knew what was wrong with me. What I didn’t say was that, after I found the lymph node, it was too late to get into the doctor’s office on Friday, and I kinda had a little freak out over the weekend. What was wrong with me? I didn’t have most of the symptoms of the few things I could think of. If it was a hernia, would my season be over before it started? What if it was more serious than that? “You have shingles. You’re the fifth person in the last week that I’ve seen with it. That’s really unusual.” And then he pointed to the poster from the CDC behind him on the door. It was the poster I had started to look at before he came into the exam room. On it, sad-looking, line-drawn people had shaded swaths on one side of their bodies. Then he gave me a prescription for the drug you get if you have herpes. I was starting to feel much better a few days after starting to take the valaciclovir. I still feel a little pain just below the skin in my hip, and I’ve read that the neuralgia—which is what this kind of nerve pain is called—can last months. Yet I still feel fortunate that my shingles wasn’t as bad as some of the pictures I’ve seen or stories I’d heard. BG Crash: Meanwhile, I was still swimming, cycling, and running. Swimming was going well, and I felt like I was getting back to my pre-illness form and speed. Running was . . . amazing! I’m still not super speedy or anything, but I noticed that at some point over the interminable winter my form improved, and as a consequence I seem to be able to run faster with the same amount of effort. Cycling is another story, since I found myself a bit off my form the end of last season. What I needed was time in the saddle. So about a month ago, I switched from mostly running to mostly cycling. I want to say that it’s been slow, but really I’m progressing pretty quickly, getting in a couple of 60-mile rides over the last two weekends. Hopefully, I’ll be speedy on Sunday for the first tri of the season and ready for the 100-mile Tour de Cure gran fondo next weekend. One thing that has been completely different—and very frustrating!—compared to last year is my diabetes abilities in the afternoon. Almost every workout for a couple of weeks ended with me either 100+ mg/dL (5.5+ mmol/L) lower than where I started. That’s quite a drop, especially given that I had been working hard to keep my BGs in a “better” range. As a result, I was having a bunch of lows (or near misses) while exercising. No amount of pre-emptive eating seemed to fix anything. The worst was a span of three days where I had to stop cycling and running in order to treat hypos. I hate stopping. It occurred to me that a few things were different. As I already mentioned, my BGs are bit better throughout the day, which (unfortunately) gives me less room for a drop like this. My training volume is also higher now, which means I’m more likely to use blood sugar, since my muscle glycogen might be slightly lower. And—this probably is the key—I had ever-so-slightly more active insulin in my system than last year. I remember being hungry in the afternoon everyday last summer and not eating because it would mess up my afternoon running or riding. Surely, there’s got to be a better way to balance the need to eat and the need to exercise. I should go back to my TeamWILD notes from last year to remember how much to lower a bolus for food depending on how far in advance of riding it is. Stay tuned. An Actual Crash: Last Sunday, I went out for a little ride. It was a beautiful day; Chrissie (my tri-bike) and I hadn’t been out for a long ride together for a while; and I was feeling pretty energetic. About 20 miles in, I decided to stop at the same park I did the weekend before to take a little “nature break.” The previous time, I accidentally punched myself in the face taking off my arm-warmers. This time I didn’t even make it into the park before starting the mayhem. Turning the corner from the highway to the park at about 10 MPH, my wheels hit sand, and I slid to a stop on my right side. Two women walking down the street saw the crash and asked if I was okay. As I stood up, nothing felt broken, although I could already feel some pain on my right leg despite the adrenaline. I’m fine. The ladies seemed dubious. So I looked at my bike and saw everything was (thankfully) exactly as it was supposed to be. My insulin pump seemed unharmed. And then I looked at my knee and shin. Blood and scrapes, but nothing that wouldn’t heal or keep me from finishing the next 40 miles. Yes, I’m okay. Thanks. 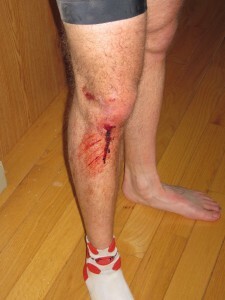 All things considered, I wasn’t badly hurt—just a little road rash—although I was bleeding pretty well. I headed into the park to do what I’d gone there to do, and then I spent a few minutes cleaning out my wounds. The bleeding from my knee wouldn’t really stop in the 30 seconds that I was willing to give it, so I used my beanie (which I no longer needed on this ride) to blot the blood and headed back out. I think I scared a few people I saw on the remainder of my loop. When I got home, Lisa didn’t believe me that it was a wolverine attack, so I had to fess up that the blood was, in fact, my own and convince her that I was, in fact, okay. After a shower it looked much better. Now, about a week later, the scabs look a bit gruesome, but the injuries they cover feel fine. It’s been the strangest two months since the New Bedford Half Marathon, and hopefully nothing else happens between now and Sunday. This entry was posted in Cycling, Diabetes, Life Lessons, Reluctant Triathlete. Bookmark the permalink. I think you should watch this video. But not at night – it will probably give you nightmares. Sara, just like actual shingles, I couldn’t wait for that video to be over. What a weird vid! Ha! I’m glad to hear your shingles don’t seem to be as miserable as some of the other times I’ve heard about them – and I’m glad you’re on some meds and getting better. Maybe with the BG’s… have you done any basal rate testing lately? Maybe with the athletic improvements you’re seeing, your body is getting more efficient at using insulin all around? Sorry to hear about your crash – glad you didn’t get hurt too bad. Wolverine attack. Ahahaha!! Nice one.